I'm excited for my guest today! Instead of having a guest post about my friend Rebekah's new ebook that launches in a month, we thought it'd be fun to do an interview, so I hope you enjoy our conversation!!! "As moms, we have voices coming at us from all directions on a daily basis – voices from the culture, the church, the parenting “experts”, our own parents, and others. And you know what the real kicker is? The voices all vary in what they are telling us is true! As if this weren’t confusing enough, add to it the fact that we are daily bombarded by lies from our old enemy, Satan, as well, and we are left with an overwhelming cesspool of deception. But take heart, mama. There is good news! We are not left to our own devices in motherhood, desperately trying to sift through all the voices on our own. God, in His infinite mercy and grace, has provided us with unchanging truth in His Word that is able to combat each and every lie that could ever be thrown at us. We need only to study the Scriptures, seeking to 'take every thought captive to the obedience of Christ'. That is the heart behind Lies Moms Believe. In this book, Rebekah seeks to show you once and for all that the Gospel is not simply Good News for your eternity. It is Good News for the here and now as well, and is relevant and applicable to each and every lie and struggle you face in motherhood. 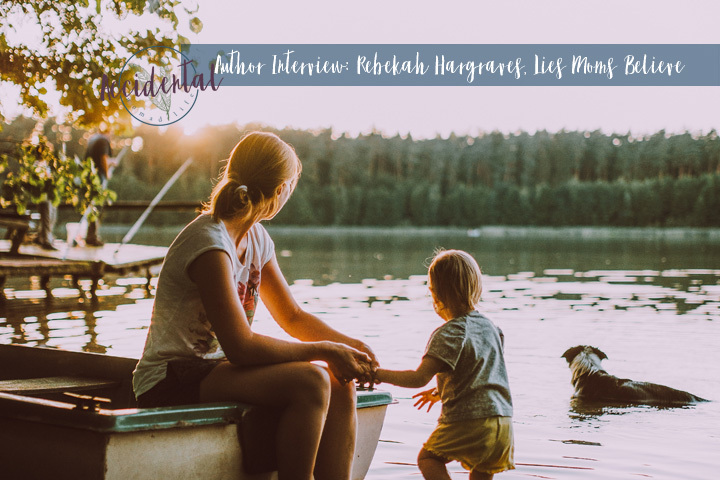 With warmth, transparency, and an unwavering passion for truth, Rebekah addresses 32 of the most common lies moms believe today about the importance of motherhood, children, the role of a mom, and more." So, I have had the opportunity to read through, a bit already and the content looks AMAZING!!!!! Rebekah, is there one lie in particular that you personally have struggled with the most? Whew, there are several! I would have to say two closely related ones that I have struggled with the most are that "I'm a bad mom" and the lie that "Mommy guilt is just something I have to live with." It wasn't until I actually pondered long and hard on the full implications of the good news of the gospel that I even realized that these two thoughts were actually lies. The Word of God truly is so relevant and so applicable to all the lies and struggles we will ever face in motherhood, not the least of which are these two. Take the first one for example - "I am a bad mom." If you remove "mom" from that sentence, you are left with "I am bad." If we know the truths of the gospel, then we know that from the moment of salvation, when the Lord looks at us, He now sees nothing but the righteousness of Christ. He has removed our sin as far as the east is from the west and replaced it with the perfect holiness of Christ. To say, then, that "I'm bad" is simply not true. Am I still a sinner? Yes. Do I still battle the old flesh? Daily. But I have to view myself through God's eyes and when I do, I see that I cannot Biblically refer to myself as being "bad" any longer. I am a redeemed sinner. Which is precisely why we don't just have to "deal" with mommy guilt weighing us down everyday. 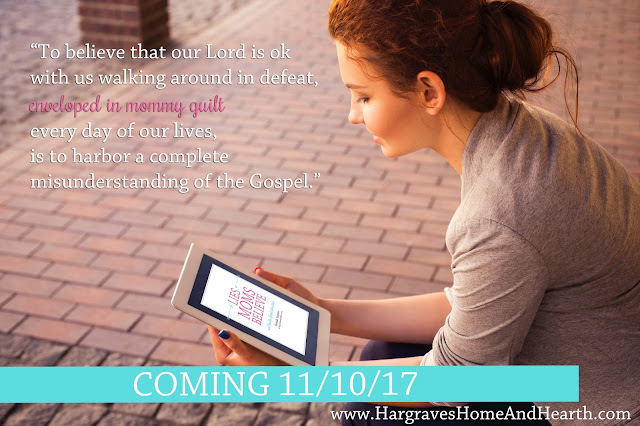 We can put that mommy guilt to death with the truths of God's Word and the realization that Jesus has forever and always taken away our guilt, our condemnation, and our shame. In your daily life, how do you combat lies that come at you actively? I tell you what - this has been God's grace in my life! It wasn't even until I started studying for and writing this book that I even took the time to ponder what it would look like to truly take my every thought captive to the obedience of Christ, exchanging the lies that invade my mind for the truth of God's Word. What they say is true - it is when you teach others that you yourself learn the most. So, truly, though I wrote this book with the desire to help and encourage fellow mamas, I feel that it truly has done that for me! This project has made me far more mindful of the relevancy of God's Word, and has caused me to love the Word and rely on it more than I ever did before. So, to answer your question, I'm more mindful of what I'm thinking in any given moment. And when I notice a thought that I know doesn't sound right Biblically-speaking, I start meditating on the Word. This is why it is so crucial for moms to do whatever it takes to be in the Word on a daily basis - if I didn't know the Word, there would be no way at all for me to combat the lies that enter my mind. I would not even recognize them as lies, let alone know the truth with which to replace them. When I know I am being weighed down by a lie, I start thinking over the truths I know from the Word. I start praying and asking the Lord to show me His truth and help me to take every thought captive, knowing that He will do just that, because His desire is for me to know the truth and have it set me free (John 8:32). How does your own mother play into the book? Well, besides serving as my editor for the book (whew, that lady is gifted! ), she played other parts, as well. :) She was my sounding board for many of the concepts I was thinking through and including into the book. Interestingly, even when I thought the book was complete at addressing 31 different lies, it was during a conversation I had with my mom one day as we were going over edits that I realized another lie has seeped into the church regarding how we should parent, and that it was enough of a big deal that I would need to go back and address it, as well. The book truly would not be what it is were it not for my mom. What do you remember about your mom as you were growing up? During my childhood, I knew my mom delighted in being at home with me and my younger brother. Her last day at her office job was the Friday before I was born the next Sunday, and she has spent the past 25+ years as a stay-at-home mom, delighting in that role and intentionally choosing it as the life she would live. She homeschooled me all the way through school, took on several different home businesses over the years so that she might supplement the family income, making it easier for her to stay at home with us, and always made it clear that there was no place she would rather be than at home with us. I was never made to feel like a burden or interruption or nuisance growing up. She wasn't perfect, of course, but I always knew she loved being my mom. I have so many fond memories of her daily reading to me (even long after I could read myself! ), playing games, taking me yard-saling with her, etc. I truly believe my childhood dream of being a mommy came as a result of watching how she enjoyed and embraced motherhood. What is your relationship with your mom like? I'm so grateful for the relationship we have. However, lest you read my answer above and think my childhood home was always perfect and an absolute heaven on earth, this was not the case. ;) My mom and I are so very much alike in personality that sometimes we clash. This particularly happened once I reached adulthood and was still living at home (I got married and moved out at age 21). I was wanting to spread my wings and exert my independence, but was still living under her roof, so we had our "moments", for sure! I remember, for example, wanting to do things in the kitchen one way, but have to frustratingly give in to how she wanted them done, because it was her kitchen! lol Now that we are no longer living under the same roof and I am a grown married woman and mom myself, she and I are much more like friends than mother and daughter, which has made our relationship so much better and sweeter than it was during portions of those turbulent young adult years. If we didn't truly have such a good relationship, I don't think we could have worked together as well as we did on this book, and the book would have suffered as a result. What one thing (I know - there are so many!) did your mom do that you try to imitate in your own motherhood? Because of the distractions of things like my phone and social media (which weren't around back then! ), I'm not nearly as good at this as my mom was, but I constantly strive to be better - I want to imitate the way our family life growing up centered around read-alouds, playing games, and cooking and baking together in the kitchen. I want my children to feel like my right-hand assistants, my blessings, my friends even now when they are little. I want them to feel my delight in them and in being their mom. I want to make the kind of precious memories with them that I have of reading together with my mom, making memories in the kitchen, and enjoying a good game of Scrabble or Careers. I want to prioritize my children and spend my time intentionally with them. Oh man, I can't imagine her being a mama, and it is so sobering to realize that, as I have heard someone say on a podcast before - I am raising the mama of my grandchildren! If there is one thing I would want my daughter to take away from this book, it would be that she doesn't need to look to the "experts", she doesn't need to look to the mommy bloggers, she doesn't need to look to her best friends, she doesn't even need to look to me - when it comes to her motherhood one day and the challenges, lies, questions, and struggles she will undoubtedly face at some point. She need only look to Christ and the Word of God. Certainly she can gain some wisdom from others and the Lord can point her in the direction of people who will be an encouragement to her. But, first and foremost, I want her to look to the Word, believing it to be all she needs, believing it to be alive and active, relevant and applicable. I want her to know that she can mother by faith, looking to the Lord for the wisdom required to know which parenting methods to implement or how to handle any given situation. I want her default reaction to life to be to open up the Word when she is facing a parenting struggle before she ever thinks to hop on Amazon for the latest "expert's" book or before she even thinks to pick up the phone and call a fellow mama friend. I want her to love the Word, to embrace it, and to believe it to be the powerful, helpful, life-changing tool it truly is. Rebekah, thank you so much for joining me today, and sharing a bit about your heart behind the book. I can't wait for it to launch, and see all the other goodies that spring from it!!! 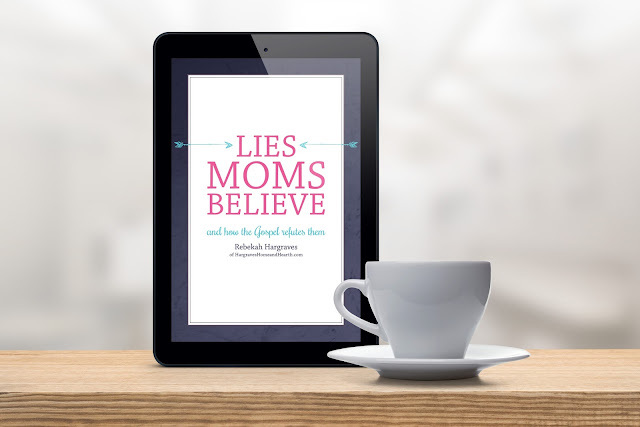 Rebekah's book, Lies Moms Believe, launches November 10th, but you can pre-order it NOW!